Field 1 - A label of some kind. In this case, that might be the user’s Akamai UUID. Field 2 - An optional field that provides descriptive information. Field 3 - A starting date (or, depending on the type of chart you’re creating, a starting number). Field 4 - An ending date (or number). Field 5 - A optional field that displays the “magnitude” for each record. For example, if you were tracking registrations by country, this field might contain the total number of registrations per country. 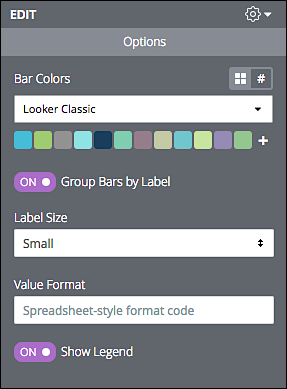 When set to On, Detail bars are shown in the same row as values. When set to Off, Detail bars are displayed in separate rows. When set to On, displays a legend at the bottom of the chart. When set to Off, no legend is displayed.